The International Space Station has a gym. It's a tiny gym, yes, and a gym that's been substantially modified to accommodate the overriding constraint of a gym that is part of the International Space Station: its removal from gravity. But it's a gym nonetheless, and it's a place that's crucial to astronauts who, without the benefit of gravity exerting itself on their bodies, lose muscle mass and bone density during their tenure in space. ISS denizens put in Hollywood-star-in-training-level workouts every day, not to be-buff themselves for a new role, but to keep them in shape for the one they have. I mention that because of Stephen Colbert. Actually, more specifically, I mention that because of C.O.L.B.E.R.T, one of the pieces of equipment in the ISS gym -- the modified treadmill that astronauts use to simulate running while they're in space. It went like this: In 2009, NASA announced a contest to name a module being added to the ISS. The new extension of the space station -- provisionally named "Node 3," a connecting module that included a cupola -- would join Unity, Harmony, and Destiny; NASA's own suggestion for the additional module was "Serenity." 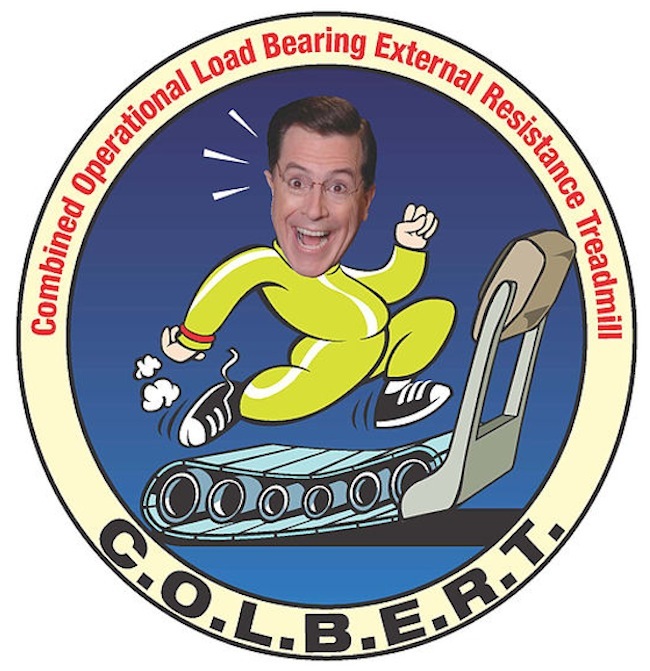 Colbert, fresh off his attempt to get himself on the ballot for the South Carolina presidential primaries, made another jokey bid: to get the module named after him. Unity, Harmony, Destiny, and Colbert. Unsurprisingly, his fans rallied to the cause. By the contest's end, NASA had received more than 1.1 million submissions; "Colbert" accounted for 230,539 of those. "Serenity" received slightly more than 190,000. NASA, however, invoked a disclaimer it had listed for the contest, saying that it had the right to "ultimately select a name in accordance with the best interests of the agency" (and adding that "such name may not necessarily be one which is on the list of voted-on candidate names"). But a compromise was struck: While NASA ended up naming Node 3 "Tranquility" -- a nod to Apollo 11's base on the moon -- the acronym-happy space agency found another way to celebrate the comedian who had hacked its contest. It named the treadmill on the station the Combined Operational Load Bearing External Resistance Treadmill. Or the, yes, the C.O.L.B.E.R.T.